This article is about the Province of Rizal. For other uses, see Rizal (disambiguation). Rizal, officially known as the Province of Rizal (Tagalog: Lalawigan ng Rizal), is a province in the Philippines located in the Calabarzon region, 16 kilometres (9.9 mi) east of Manila. The province is named after José Rizal, one of the main national heroes of the Philippines. Rizal is bordered by Metro Manila to the west, Bulacan to the north, Quezon to the east and Laguna to the southeast. The province also lies on the northern shores of Laguna de Bay, the largest lake in the country. Rizal is a mountainous province perched on the western slopes of the southern portion of the Sierra Madre mountain range. * Although provincial government operations have moved to Antipolo, no legislation on the national level has recognized the new capital yet. Pasig remains the de jure capital of Rizal. The provincial capital of Rizal is situated in Antipolo while Pasig, Metro Manila, outside the jurisdiction of the province, is the official capital. Tagalog settlement arrived some time in the pre-Spanish period. The provincial territory began with the organization of the Tondo province and Laguna province during the Spanish administration. Some of the towns like Pasig, Parañaque, Taytay and Cainta were already thriving. In 1853 a new political subdivision was formed. This consisted of the towns of Antipolo (now a city), Bosoboso, Cainta and Taytay from the Province of Tondo; and the towns of Morong, Baras, Tanay, Pililla, Angono, Binangonan and Jalajala from the Province of La Laguna, with the capital at Morong. This district was changed to Distrito Politico-Militar de Morong after four years. Many Rizaleños organised themselves into a resistance movement, grouped in some places as the Hunters ROTC and the Marking's Filipino-American Troops (MFAT) in guerrilla camps in the province's mountains. The guerrilla forces also aided Filipino soldiers in the Philippine Commonwealth Army and American troops in fighting the Japanese troops. The local military unit of the Philippine Commonwealth Army was active from January 3, 1942 to June 30, 1946, while the local unit of the Philippine Constabulary was active from October 28, 1944 to June 30, 1946. [further explanation needed] United States forces had liberated parts of Luzon by January 1945. During the Allied Liberation that lasted until August that year, the combined U.S. and Philippine Commonwealth military ground troops aided the local Rizaleño Hunters ROTC and MFAT. Talim Island, the largest island situated within the Laguna de Bay, is under the jurisdiction of the province. Figures prior to 1980 exclude areas that became part of Metro Manila. The population of Rizal in the 2015 census was 2,884,227 people, with a density of 2,400 inhabitants per square kilometre or 6,200 inhabitants per square mile. Due to its location being in the heart of the Katagalugan, almost all of the residents of Rizal mainly speak Tagalog. English and Filipino are used as second languages respectively. Roman Catholicism is the predominant religion with about 80 percent adherence (Diocese of Antipolo, [Catholic-Hierarchy], 2004)[full citation needed]. And 2% are from Members Church of God International of Bro. Eli Soriano. Various Christian groups exist such as Iglesia Filipina Independiente, Born-again Christians, Jesus Is Lord Church, Iglesia Ni Cristo, Jehovah's Witnesses, Baptist, Church of Christ of Latter Day Saints, El Shaddai (movement) Methodists, Presbyterians, Seventh-day Adventist and other Evangelical Christians. Muslims, Anitists, animists, and atheists are also present in the province. In a study recently[when?] conducted by the National Statistics Coordination Board (NSCB), Rizal province came out to be the Philippines' least poor province with a poverty incidence rate of 3.4%, even lower than that of the National Capital Region or Metro Manila.. In April 23, 2013, the National Statistics Coordination Board (NCSB) reported that Rizal, from being the least poor province in poverty incidence moved down to the 3rd Place, with Cavite taking over as the least province by 4.1% (compared to Rizal's 7.6%) and Laguna for 2nd with 6.3%. Higantes Festival — celebrated every November 23 in honor of their patron saint St. Clement. Higantes are made of bamboo and colorful cloth and its faces of paper mache. Mt. Tagapo — located in Talim Island, a 270-metre (890 ft) mountain also known as "Bundok ng Susong Birhen"
Saint Jerome Parish Church — built in 1615 by a Chinese craftsmen. A first class relic of Saint Jerome was also in the church. Pililla Rizal Wind Farms — built by AltEnergy to give electricity to the whole Brgy. Halayhayin and Metro Manila as well. This also serves as a tourist attraction, and is located on the mountains near Laguna de Bay.Tiger Sanctuary also known as "pililla zoo"
PHILCOMSAT — the owner of a parcel of land situated in Barrio Pinugay, Brgy. Tandang Kutyo, Tanay where its Philippine Space Communications Center (PSCC) is located. The PSCC, which principally consists of herein respondent’s satellite earth station, serves as the communications gateway of the Philippines to more than two-thirds of the world. Incidentally, the property had been planted with fruit trees, rice and corn by farmers occupying the surrounding areas of the PSCC. Taytay Tiangge — There are around 10 garments center operating in Club Manila East Compound. Each garment center has hundreds to thousands of stalls selling different clothes by family owned garment factories. ^ a b "List of Provinces". PSGC Interactive. Makati City, Philippines: National Statistical Coordination Board. Retrieved 23 October 2013. ^ a b Rosario, Ben (23 September 2017). "Bill seeks to make Antipolo City the capital of Rizal". Manila Bulletin. Retrieved 23 January 2018. ^ "Presidential Decree No. 824 - Creating the Metropolitan Manila and the Metropolitan Manila Commission and for Other Purposes". The LawPhil Project. 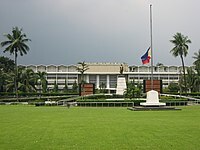 Malacañang, Manila, Philippines. 7 November 1975. Retrieved 17 April 2016. Section 2. Territorial Jurisdiction. The Commission shall have jurisdiction over the cities of Manila, Quezon, Pasay and Caloocan and the municipalities of Makati, Mandaluyong, San Juan, Las Piñas, Malabon, Navotas, Pasig, Pateros, Parañaque, Marikina, Muntinlupa, and Taguig in the province of Rizal; and the municipality of Valenzuela, in the province of Bulacan, all of which together shall henceforth be known as Metropolitan Manila. ^ "gmanews.tv, Rizal capitol to be transferred to Antipolo". Gmanews.tv. 2008-06-17. Retrieved 2012-04-24. ^ a b c d "Province: Rizal". PSGC Interactive. Quezon City, Philippines: Philippine Statistics Authority. Retrieved 8 January 2016. ^ "Weather forecast for Rizal, Philippines". Storm247.com. StormGeo AS, Nordre Nøstekaien 1, N-5011 Bergen, Norway: StormGeo AS. Retrieved 21 April 2016. ^ "Rizal poverty incidence rate". NCSB. 2013-04-23. Archived from the original on 2013-04-29. Retrieved 2013-05-05.